my idols of British crime fiction, Peter Robinson. If you're not familiar with Peter's novels featuring Yorkshire Detective Chief Inspector Alan Banks, you've perhaps seen the very successful TV adaptation of the books. But I've been a fan since long before Banks arrived on television--since, in fact, before I met Peter at my first Bouchercon in Pasadena in 1991. He was very gracious to me, a wanna-be writer, and encouraged me. I sold my first novel five months later. Since then, I consider myself fortunate to have had the opportunity to do panels and book signings with Peter (and to have had a pint with him at his local--as in pub--in Toronto.) He remains as gracious and talented as ever, and the advent of a new Banks novel goes down on my calendar as a greatly anticipated treat. 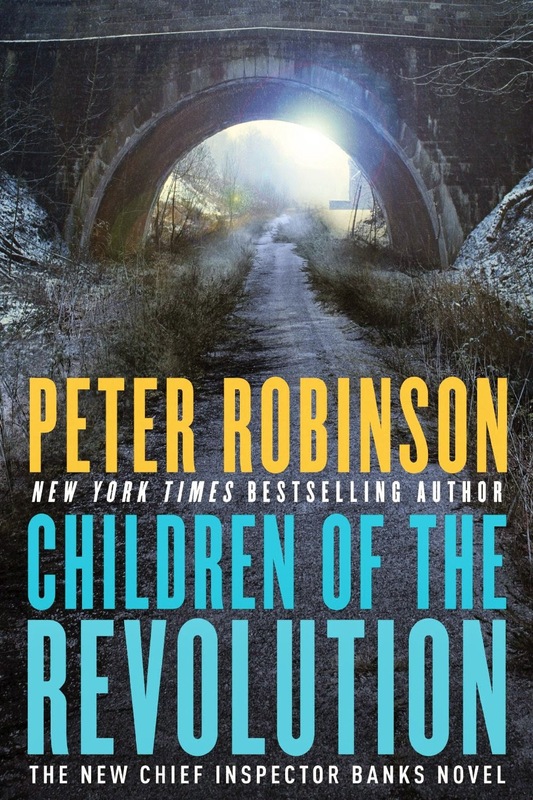 THE CHILDREN OF THE REVOLUTION is Peter Robinson at his finest, a superb tale of mystery and murder that takes Detective Chief Inspector Alan Banks and his colleague DI Annie Cabbot back to the early 1970s—a turbulent time of politics, change, and radical student activism—to solve a case that has been decades in the making. The body of disgraced college lecturer Gavin Miller is found on an abandoned railway line by a woman out walking her dog early one winter morning. In the four years since Miller's dismissal for sexual misconduct, he's been living like a hermit, listening to music from his college days and existing as frugally as possible on the outskirts of a small village. So where did he get the five thousand pounds found in his pocket? Leading the investigation, Detective Chief Inspector Alan Banks begins to suspect that the victim's past may be connected to his death. Forty years earlier the dead man attended a university that was a hotbed of militant protest and divisive, bitter politics. And as the seasoned detective well knows, some grudges are never forgotten—or forgiven. Just as Banks is about to break the case open, his superior warns him to back off or risk losing the promotion he has been promised. Yet Banks isn't about to stop, even if it means risking his career altogether. He's certain there's more to the mystery than meets the eye, and more skeletons to uncover before the case can finally be closed. One of the things that makes Robinson's novels so gripping is the strong sense of place they convey, and here's Peter to tell us a bit about how he creates such spine-tingling atmosphere. PETER ROBINSON: Sometimes you can feel like a real idiot for not realising something about the way you write until it hits you right between the eyes. I learned a lesson writing CHILDREN OF THE REVOLUTION, my 24th novel, that taught me just how little I know about my own writing process. Unusually for me, I had plenty of ideas about characters, plot and themes but I just couldn’t get started. I’m not an outliner, so I usually don’t know where a story’s going to take me. I generally begin with the opening scene of the book and just go on from there. This time, I had a whole department store full of treats set out ahead, but I couldn’t find a way in. Then one day I went for a walk in North Yorkshire with a friend who seeks out walks you don’t find in the tourist guides, and we came across this disused railway line. It felt like a very lonely, isolated place to me, and I realised immediately that this is where the body is found, this is the opening scene, the way in I’ve been looking for. And from then on it all fell into place. The place may not be in the opening scene, but it usually is, and more often than it is where the body is found. There may be more than one important place in a book. In WATCHING THE DARK I had the police convalescence centre ( in reality a hotel), the abandoned farm complex on the moors and the Estonian city of Tallin, with its cobbled streets and narrow winding alleys, where I was fortunate enough to be teaching summer school that year. Even back as far as CAEDMON’S SONG (U.S. title THE FIRST CUT) I had an idea for a story about a woman who survived a serial killer’s attack and tracked him down, but I couldn’t get the story moving until I approached Whitby over the North York Moors one beautiful day and saw the blue sea stretched out below, the ruined abbey brooding over the scene from its hill, fishing boats bobbing in the harbour, their masts flashing in the sun. That was where Martha arrived in the first scene of the book, and much of story played out in its streets and along the coastline.. IN A DRY SEASON became a reality when I visited Thrushcross Reservoir during a drought and thought what a wonderfully eerie place to find a body. Maybe not everyone thinks that way on walks through beautiful countryside, but then I’m a crime writer! I used to enjoy a walk through a small hidden dale, and every time I went past a derelict house with an overgrown garden I used to pause and look closely at it, looking for signs of life, trying to imagine the lives that had been lived there. Eventually it became Grace’s house in BEFORE THE POISON. I may change certain details about the places, but until I stumble across the right one in my wanderings my books are only a vague cloud of words and images beyond my grasp. 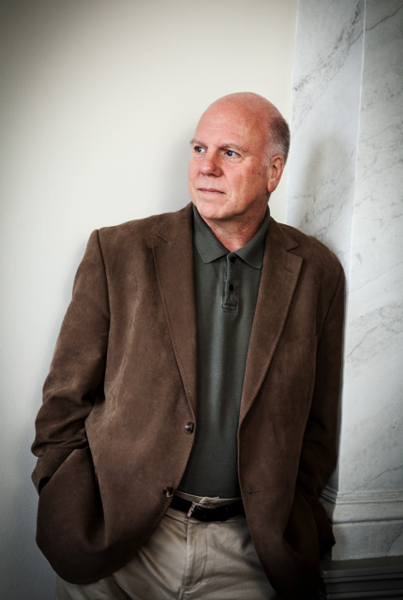 Peter Robinson’s internationally best-selling and award-winning Inspector Banks novels have been named “Best Book of the Year”by Publishers Weekly, a “Notable Book” by the New York Times, and a “Page Turner of the Week” by People. Robinson was born and brought up in Yorkshire, and now divides his time between North America and the UK. I think it is fascinating how a place can make a story come together for you. I am curious though . . . does it always have to be a new place that you discover or can you achieve the same result by thinking of a place that you’ve already visited and make that work for your place in the story? I am looking forward to reading “Children of the Revolution” . . . .
Debs, this is terrific. I'm so glad you have Peter here today. The two of you write such interesting books not just for their great stories but for their being so well-researched. I just now realised that I had previously thought of research as something that would add to the complexity of the story, but really after reading Peter's bit about the walk in North Yorkshire to the abandoned rail line I saw it all differently. Walking out led to a discovery of place and associated feeling or sensation, in a way that seems that it was richness and depth that were added more than complexity, but of course that too. Peter, you mentioned a few walks that led you to discover story ideas. Is it usually a walk that does it for you? I can't leave here without saying I love Banks, and I'm very excited to have a new book of yours to read. Thank you! Oh wow, fabulous to have you here Peter--we are such fans!! Deb's question about culture confusion got me to remembering a heated discussion that occurred at a board meeting attended by English and American English speakers. The Englishman wanted to table a topic, which the Americans strenously objected to because it was too important to be tabled. Finally someone came to the conclusion that the two sides were violently agreeing since in England to table a subject is to bring it up (put it on the table for discussion) whereas we Anericans table something by putting it aside on a back table. It was so wonderful to learn more about Peter at Malice last year. Joan's question is mine, too — does it have to be a new place? I'm just finishing Children of the Revolution and am enjoying it very much. I notice that you incorporate loads of references to music, mostly popular, as a way to evoke a period (the 60s and 70s, in this case). I appreciate these references, although, sometimes, like Winsome Jackson and Annie Cabot, I'm clueless about the music. Have you ever thought about giving your readers a playlist for each novel? And, are you a serious fan of pop music from the past decades or do you research for each book? I found myself lying awake last night thinking about the fact that this is Peter's 24th novel. I'm on my sixteenth and haven't run out of ideas yet, but I do worry that one day I will. What about you, Peter? Peter and Deb are two authors who I immediately think of when I think about the power of setting in story. So great to see them here in discussion together. Peter, is there a place you want to set a novel that you haven't yet been able to find the right story for? How timely! My father just recommended this series - books & TV - to me last week and I planned to check them out. I find places suggest stories all the time. And yes, unlikely places. For example, I'm itching to set a story in the Laurel Caverns, a very scenic area near me. Just haven't found the right story. And a news article about building a new lookout point over the Yough River immediately suggested a story to me. And I wrote a whole story based a chance comment at Bouchercon 12. Someone heard I was from Buffalo and said, "I've always though of Niagara Falls as a great place for a murder mystery." I also want to know if it's has to be a new place. Looking forward to getting to know Banks. I think I'm a robot. I can't seem to get the distorted letters right. And I don't have a password. But I'll try to answer. It doesn't have to be a new place. Sometimes a remembered place that casts a spell works. I think the newness helps to stimulate the imagination, though, if it excites me with its possibilities--usually as a good place to find a body! Well, that worked, so I'll risk another! It's great to be invited to take part in this, and thanks to everyone who has posted comments and questions. I don't know how to respond individually so I'll answer the main questions. Yes, I like the music I write about, but I still have to research it. Can't rely on memory any more! There are playlists for many of the books at www.inspectorbanks.com and we hope to have them all up eventually. I can so relate to being inspired by a (derelict!) house... and once a story is well and truly anchored, it's easier for me to move forward. I'm a HUGE fan of your work, Peter! So thrilling to have you on Jungle Red. Peter, Children of the Revolution, Abbatoir Blues--what great titles! Do you struggle with them or do they just come to you? And do you have to have a title before you can write the book? Peter, do you ever revisit a place from the past and see it in a completely new light? Does it lead you to new and different story "avenues"? Peter, I'm thrilled to have another series set in England to start reading. I'm a big fan of sense of place, and having insight to your discovery process in this element will make your books especially enjoyable. I love that you think about finding dead bodies in places you come across in your daily life. Now that's a person really in tune with their work. Your needed connection to a place before the story falls into place mirrors my need for that when reading a novel. Hallie, I like your description of a story being well and truly anchored. It's something I get great satisfaction from in all of the Reds' books. I guess my question is a rather usual one, but with your prolific career, I'm curious as to how disciplined you are about your writing (I'm imagining quite so). Do you regulate your days into writing time? Also, do you do an equal amount of writing in Toronto and England, or is England more research oriented and Toronto more putting it all together and writing it? Thanks for your responses and more questions--and the advice on how to deal with the distorted letters! The book titles usually come from songs--CoR is T.Rex and AB is Nick Cave, for example. Abattoir isn't common usage in the USA I'm told, so we may have to change the title to Slaughterhouse 6. I'm quite a disciplined writer when I can be. Sometimes there are just too many distractions. I like to get at least a few weeks without any major interruptions and build up some momentum. I work here in Toronto and in England, where I'll be for most of this summer. As I'm between books at the moment, it's a slow process getting into gear again. That's fine, because it frees me to do other things while my subconscious is working on the book. When the deadline is approaching, though, even my family hardly sees me! Oh to be in England!! I love the sound of these books and wonder how I missed the PBS series. I keep watching Poirot over and over. Thanks, Deborah, for the info about the refresh button. These old eyes often have a problem, especially with twisted letter. Why do they do that? Denise, I find that the captchas with the numbers are easier to read than the ones with letters. Peter, I don't have a question for you, but wanted to give you a bravo for your wonderful Inspector Banks series. Last year I re-read all the books in one fell swoop so I could clearly see the masterful way in which your characters develop over the series. Best wishes for many more writing years! Thanks everyone! I was at a book launch for Hilary Davidson here in Toronto tonight. It was a great launch and it's a great book. Blood Will Tell. I do hope you continue to enjoy DCI Banks, and best of luck with the twisted letters!